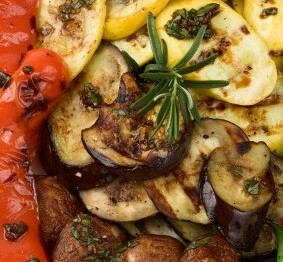 This is an amazing grilled vegetable recipe filled with the savory flavors of the Mediterranean. 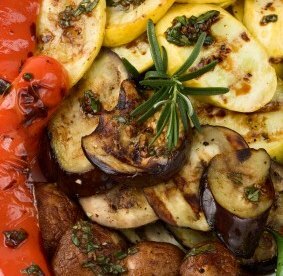 Eggplant, zucchini, colorful peppers and mushrooms are grilled on the barbecue or under the broiler, then coated with a garlic, rosemary and oregano mix. Marinate it in a balsamic and olive oil blend and you are taken to the Mediterranean just by smelling it. Cut the peppers and mushrooms into quarters and cut the eggplant and zucchini into fairly thick slices. Spread the vegetables on a baking tray and broil them for 10 to 15 minutes, then turn them and broil the other side for an additional 10 to 15 minutes. Watch closely to make sure the vegetables do not burn. Meanwhile, mince the herbs and finely chop the garlic cloves, or press them in a garlic press. Mix all the marinade ingredients together and season with salt and pepper. Arrange the vegetables in a casserole and cover the still hot vegetables with the marinade. 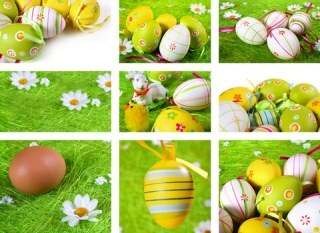 Let them sit for at least 6 hours in refrigerator. Drain the excess oil before serving. The marinated vegetables keep in the refrigerator for up to a week if no vinegar or lemon juice is added. (You can then add the vinegar or lemon juice just before serving them). Instead of just the red peppers, use 1 orange pepper, 1 red and 1 yellow to really add a burst of vibrant color to this recipe. The vegetables can also be grilled on a barbecue or an indoor grill. The barbecue is perfect because it adds that hint of smokiness that is perfect in grilled vegetables. The excess oil mixture makes a great salad dressing. This is SUCH a healthy recipe. It is full of a variety of vegetables, in line with our “eat a rainbow’ philosophy and is topped with super healthy olive oil. EVOO (extra virgin olive oil is one of the healthiest foods to include in our everyday eating plan. This recipe is perfect for those looking for healthy diabetes recipes. It’s full of healthy vegetables, olive oil and it’s low carb. This versatile vegetable side dish can be served any time of year and works well for an every day meal, a barbecue or as part of a dinner buffet. If you like this recipe, I’d love you to Pin it to Pinterest, Tweet about it and Like it on Facebook. Add your own recipes and comments below. Look here for other vegetable recipes that are as tasty as this Mediterranean grilled vegetable recipe.